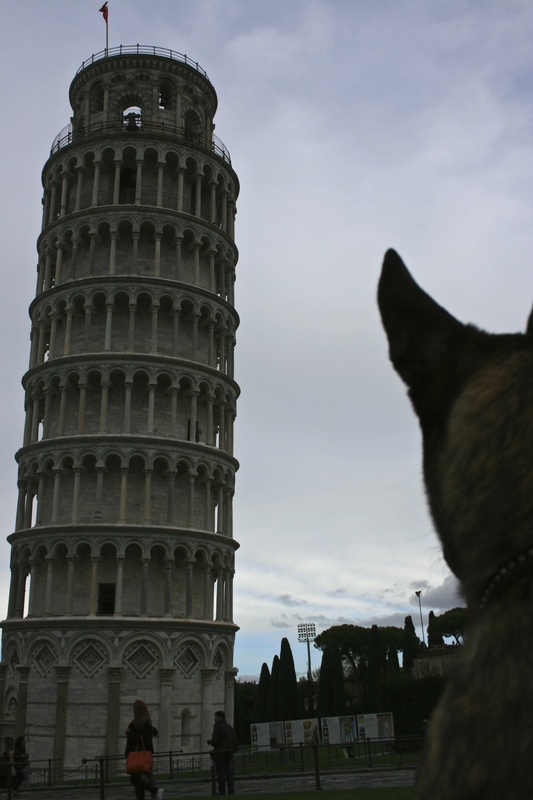 Italy may be the best place in the world to travel with your dog. The French like dogs. Italians love dogs. I have gone to restaurants where Zala has been given packages of dog treats, cheesy pasta, ham, chocolates (without my consent), and pizza. Walking down the street I was always being stopped by Italians petting and loving on my dog. After one month in Italy, my dog believed her name was ‘Ciao Bella!’ (Hello Beautiful!). Trains accept dogs just as easily as France. I personally have only taken the train from Chambery, France to Milan, Italy. This ticket is a flat rate of 30Euros for your pet. I believe this holds true for all train travel in Italy. My passport was checked crossing the border, but Zala’s was not. Don’t forget your dog muzzle. Take your dog on the bus and do so confidently. I did it in cities throughout Italy including Venice, Bologna, and Rome. People will appreciate you following the rules by putting a muzzle on your dog before you get on. I was thanked numerous times for doing this courtesy. Not everyone is comfortable with dogs, especially large ones. I never took my dog on the Metro. I expect their dog restrictions are lax. Check online before you try. Many hotels do not post if they accept dogs and some only allow small dogs. E-mail or call anyways. Most hotels will accept large dogs even if their website does not say so. Most do not charge a fee either. Unless it is a meat deli or grocery store, assume your dog can come inside. I got told off numerous occasions because I tied my dog outside and the owner or employee demanded I bring my dog inside because she ‘looks sad’. Please view my posts on specific Italian cities where I talk in detail of all the strange places that accepted my dog. No; except the ruins of Pompeii. Dogs are allowed there. See my post and photos on Pompeii. We loved Italy. I agree. BUT I would say that there is ONE place that would give Italy a good run for its money. The Greek islands. I have never ever been around so much dog friendliness. Our Montecristo spent about 2 weeks pretty much off leash running around the small streets, even letting himself into people homes to much “oooh” and “aaaah”. We sailed so it was a “hop off at the next island” kind of thing. Just so you know the ferries have kennels for dogs. (I wrote a post) What a blast and all the beaches – no exceptions were pet friendly. For us … in Italy … Florence is and remains our favorite spot. We rented an apartment for 3 weeks and just fell in love. Zala and I will have to see Greece. Florence was our favorite city in Italy also. Wow, great blog. I feel inspired. Just one question though, could you actually take your dog into the Uffizzi gallery and the Palazzo Vecchio? Thanks for the great info. As I stated in the article, churches and museums do not allow pets, but I did take my dog inside of the ruins of Pompeii and I was asked by the staff at the Farmacia Santa Maria Novella to bring my dog inside. I left my dog in my hotel room for the short period I was in a museum. If it was a quick tour of a church, I would simply tie her outside the building. All dependent on your pet’s tolerance level and behavior. What about the Boboli gardens? Could you go in there? I’m also guessing the Giotto bell tower was off limits. Pets are not allowed in Boboli gardens and definitely not in the Giotto bell tower. I went early in the morning when there are few tourists and simply left her outside. Check out the post made by my friend Monte Cristo Travels. He goes in depth about traveling in Firenze from a little dog perspective. Hello! I am loving your blog. I’m very interested in traveling with my GSD and this is very helpful! I saw you mentioned Rome in there. How was navigating the area with the dog and visiting the outdoor attractions? Thanks! I drove a rental car with my dog around Italy. When I was in Rome, I rode the bus with my dog. Not sure if it was allowed but I remained quiet and kept my dog muzzled. I also travelled during the quiet time in tourist season. The buses are going to be pack during high times and a large dog may be ill received. I was thanked several times in my travels for muzzling my dog. This seems the catalyst for complaints- individuals who are scared or uncomfortable around dogs.